Christmas time means cookies and around these parts, Christmas cookies most definitely mean macaroons. 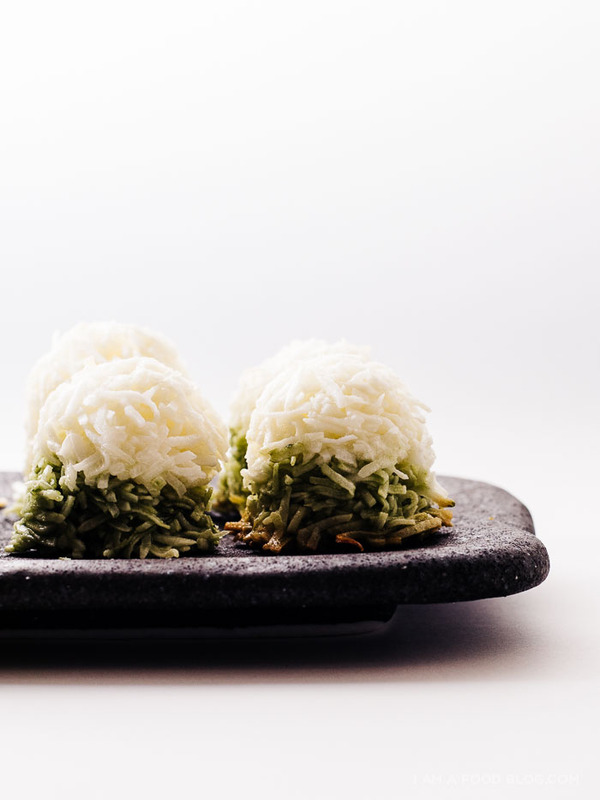 No, I don’t mean those delicate, finicky French macaron – I mean crisp and coconutty haystacks. A good coconut macaroon is a delicious thing: mounded, crisp and crunchy outsides and soft chewy insides. I’m a huge fan of macaroons, especially when they’re homemade. I wanted to do something a bit different this year and since I’m in Tokyo, I thought I’d use one of the ubiquitous flavors that they use in their desserts: matcha. I love how these guys ended up looking like snow-topped hills. 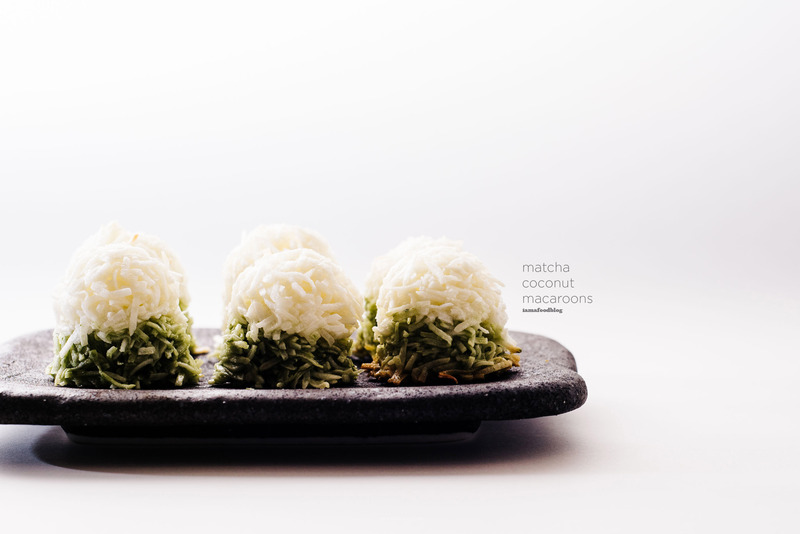 Coconut and matcha together are absolutely fabulous. 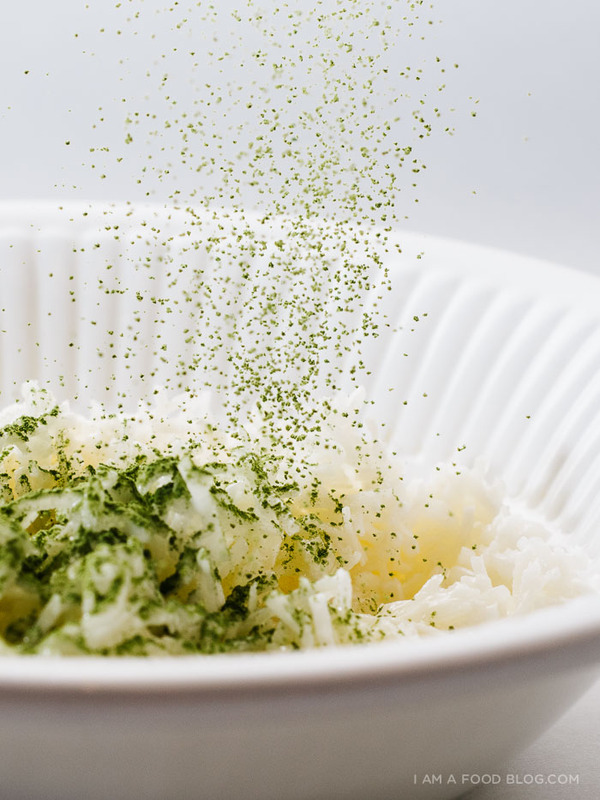 The nuttiness of the coconut pairs well with the slightly sweet green flavor of matcha. 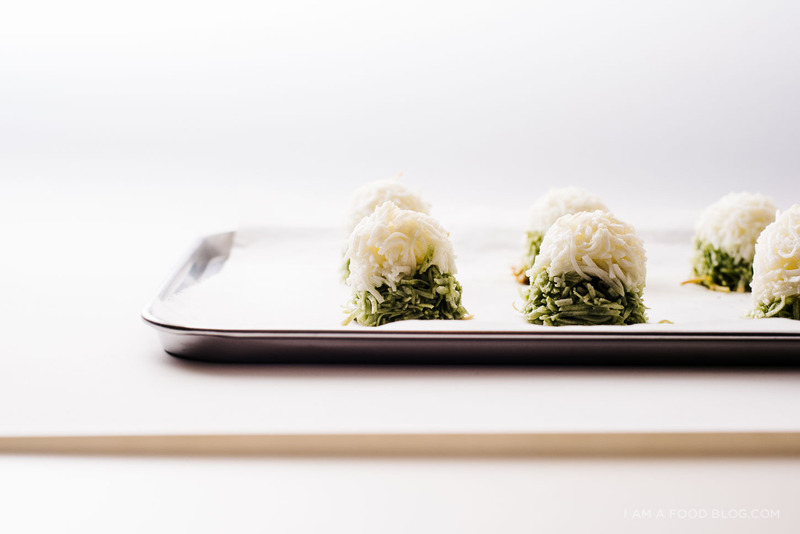 Of course, if you don’t have any matcha on hand you can feel free to make these without. This recipe is one I hold near and dear to my heart. It was given to me by a previous coworker. At Christmas time, she brought in a huge batch of macaroons, her favorite cookie. I had one and was immediately smitten. She was kind enough to share her mom’s recipe with me, which I thought was so lovely. I’ve met a lot of people who aren’t open to sharing family recipes but what made this one even more special was the fact that it came from this particular co-worker. See, when I first started working with her, she didn’t quite like me. At the time, our office was expanding and management had recruited several new hires (I was one of them!). She was one of those workers that was a little bit set in her ways and didn’t exactly welcome me and my new friends with open arms. But, after a couple of months of lunch breaks and coffee breaks and commiserating together over clients, she became one of my new crew’s champions. I don’t have co-workers anymore, not in the traditional sense, but I do have blogger friends and I find that the network of bloggy friends I’ve made is completely awesome. Honestly Yum got us together to do a little virtual cookie exchange – if it was in real life I’d eat ALL THE COOKIES! To check out what we’ve been baking up, hover over the images and click! Combine the coconut, sugar, and flour. Stir in the egg whites. Divide the batter* into two bowls. Sift the matcha into one of the bowls and mix well. Use a cookie scoop to scoop out half a portion of white batter and then scoop out the remaining with green. Place on a parchment paper lined cookie sheet and bake for 18-20 minutes or until edges are golden brown. The tops will remain a pure white with little to no browning. Let cool and enjoy! Notes: It’s not really a batter, it’s quite dry and not at all runny. When you scoop it out with a cookie scoop, it should hold its shape. I love all of them! They too cute almost like mini snow topped Christmas trees. I loved that story about your coworker–I had a similar experience at my last job and it’s the best when you finally win someone over. It kind of makes that relationship extra special. It’s pretty much the same level as family recipes. Everything always comes out tasting so much better, right? And regarding these particular cookies, while I’m sure they would have been awesome sticking to the og recipe, making grassy hills covered in mounds of snow seems like a better idea to me! These are so beautiful! The two-tone colors are so great. 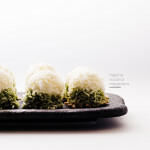 I definitely want to make these; I LOVE LOVE LOVE coconut macaroons and the matcha sets it over the top. Awww, what a cool story! Hooray for family recipes. + these are the coolest looking macaroons I’ve seen. Can’t wait to give them a try!! oh i loooooove mixing up holiday cookie flavors, getting a little alt with it. what a freakin GREAT cookie swap!! i love that image collage you’ve made of all of the posts too. 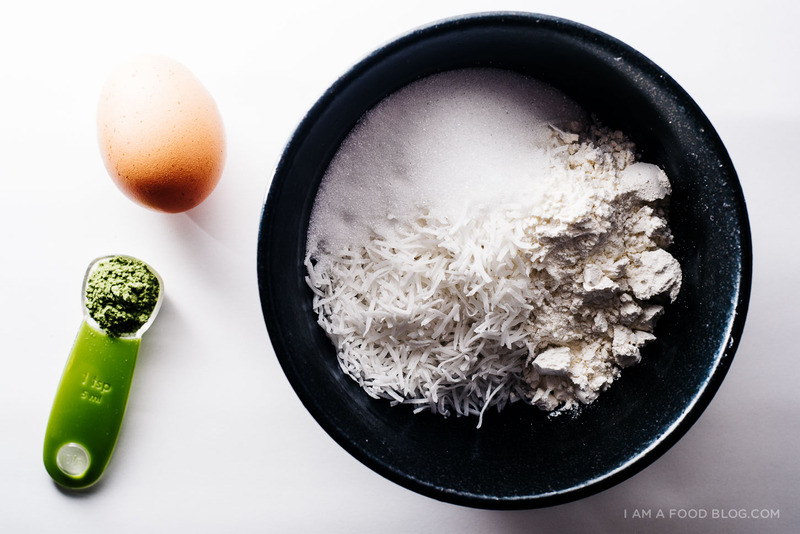 really helpful :) aaaaand i <3 coconut macaroons and matcha so yep i'm making these this weekend for my own goddess lady cookie swap IRL! These are so fun! The colors certainly are perfect for Christmas! These are sooo cute!!! I love that they are like, ombre or something. Adorable! Ohhh, goodness gracious me! I’m still catching up on all your posts and whatnot, but the fact that you’re in Tokyo is total <3 <3 <3 for me. How amazing! 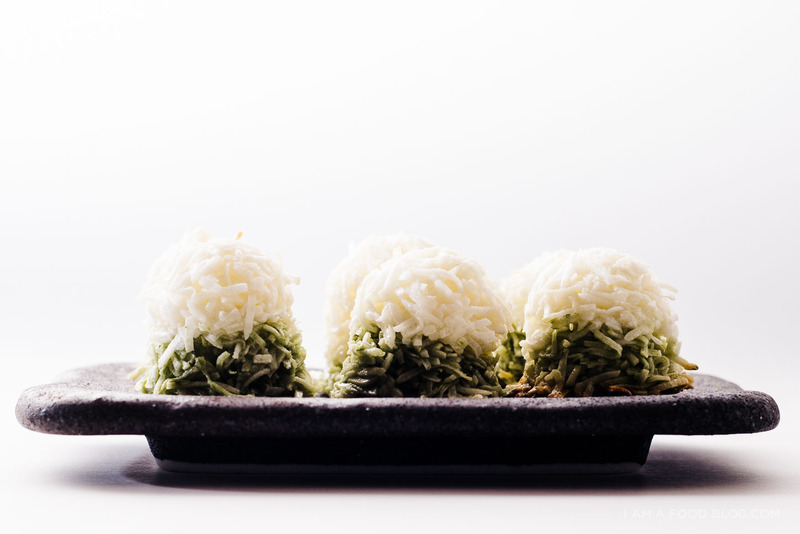 Matcha just warms my heart–I love it in ice cream mochi best, but I'm definitely saving this recipe for the books. Thanks for a wonderful share, and happy holidays! This look super delicious. . Stupid question – do i need to beat the egg whites first? As you can tell I’m a novice in the kitchen. Thanks so much STEPHANIE LE!